Technology • QLess system allows customers to call and get a spot in line, wait where they want, show up when it is their time to be served. 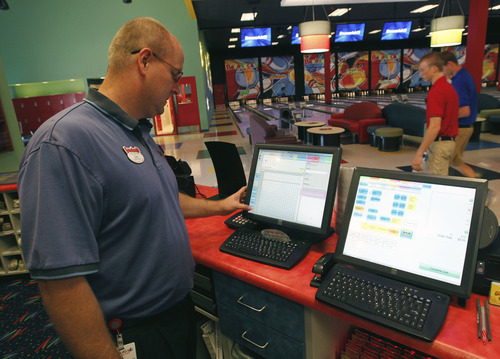 Al Hartmann | The Salt Lake Tribune Farmington Boondocks General Manager John Scherbarth uses a point-of-salessytem using Brunswick Vector Software to reserve bowling lanes. 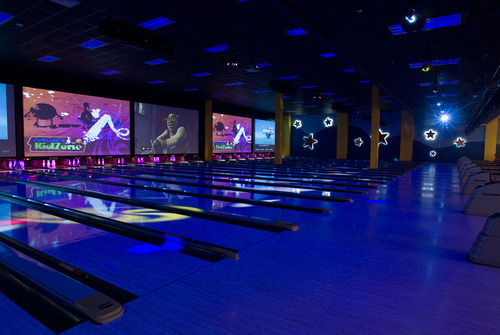 Boondocks is now using a new technology that creates a virtual line for folks using its bowling alley in its Colorado location. The company is planning soon to begin using the system in its Utah fun centers. 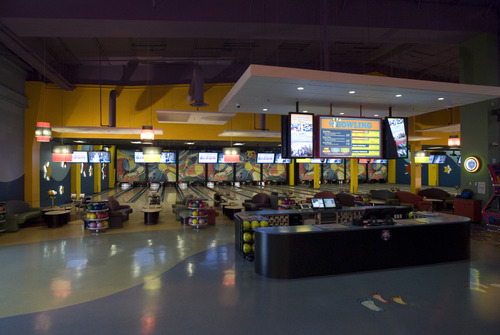 | Courtesy The Boondocks bowling center in Northglenn, Colo. uses technology developed by QLess to reduce the wait times for its visitors. | Courtesy The Boondocks bowling center in Northglenn, Colo. uses technology developed by QLess to reduce the wait times for its visitors. | Courtesy The Boondocks bowling center in Northglenn, Colo. uses technology developed by QLess to reduce the wait times for its visitors. Waiting in a long line, whether it is at a restaurant, drivers&apos; licence office or an amusement park, is sheer misery for most people. But now, new technology exists that promises to lessen the pain by allowing consumers to step into line wherever they want, wait their turn off-site if they prefer and only show up when it is their time to be served. Damon Day is the co-owner of the Boondocks Fun Centers, which operates locations in Draper, Kaysville and Northglenn, Colo. His company for the past year and a half has been using technology developed by Pasadena, Calif.-based QLess to allow Boondocks&apos; customers to stand in a virtual line while waiting for an available bowling lane at its Colorado amusement center. "It&apos;s a great system," Day said. 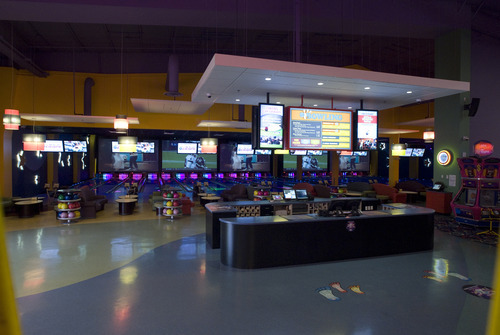 "Our visitors can sign up for a bowling lane using their cell phones and while they are waiting they can go off with their families and do something else fun. Then, when their lane is about to become available the system will call or text them to let them know." Day said his company plans eventually to offer QLess technology at its Utah locations, which offer a variety of family activities including go-karts, arcades, laser tag, miniature golf and batting cages. "As long as people have cell phones, it works very well," he added. The QLess technology was developed by Alex Backer, who came up with the idea of a virtual waiting line while biding time to board a ride at Knotts Berry Farm in Southern California. "I was thinking that there had to be a better way," he said. With QLess technology, customers can call into a central number to get a spot in line and find out how long their wait will be. They can then go off and do something else without worrying that they will lose their spot in line. And, if a customer is busy when they get their call that they turn is at hand, they have the option of rescheduling without having to go to the back of the line. And for businesses it is a great way to improve customer satisfaction, he said. "The traditional method of letting customers stand around in a line waiting to be served is like collecting them in a giant colander. There are going to be a lot who get upset with the wait and just leave," Backer said, estimating long waiting times are responsible for businesses losing up to 50 percent of their clientele. "We&apos;re hearing from customers all the time who really like the system. They like the idea of being able to get in line anywhere, even at home," Backer said. Backer said the QLess system is software-based so no special hardware is required. "All a business really needs is a Web browser." Basic installations are inexpensive for small businesses but can run into seven figures for large corporations such as Fortune 500 companies, he said. "We promise our customers a 400 percent return on their investment within four months," Backer said, noting that return that results from additional spending by patrons is something easy to demonstrate using data a QLess system can gather for the clients. By one estimate, Americans spend roughly 37 billion hours each year waiting in line, time that often is fraught with tension, boredom and uncertainty over when their time to be served will arrive. QLess estimates that since its founding in 2007 it has saved over 10 million users worldwide a combined 226 years of their lives. Five of those years, it estimates, were saved at the Colorado Boondocks Fun Center. Backer said QLess systems are being used by thousands of businesses, including automobile dealers, medical facilities, financial institutions and amusement centers. "QLess is ideal for amusement parks and centers where long lines seem to be abundant," Becker said, commenting on the use of his company&apos;s software by Boondocks. "When waiting to spend fun time with the family, the last concern of customers should be time they waste not having those memory-making moments."